Art happenings by our members and for our membership. The Wednesday Night Painters are in full swing at Lindbergh High School from 7-9 PM, Wednesdays through April 28, except Mar 24 (spring break.) Very comfortable spacious room, only $5 per session. Grab a friend and go paint! Miriam Krone is part of a show being held the month of March at The Framin’ Place in Chesterfield. The show consists of 9 artists from the Mid-Missouri Fine Arts Society who did a painting a day for the month of February. This is a multi-media show. Miriam may be the only one who worked in watercolor (on Aquabord). 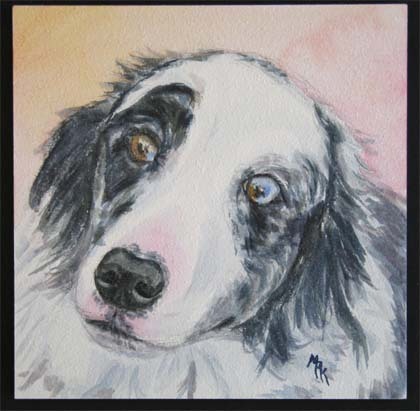 Her theme has been “Pet Personalities.” All pieces are 6 x 6″. A reception is being held Saturday, March 13 from 1 to 4pm. The Framin’ Place is located in the Four Seasons Shopping Center, Olive and Woods Mill Road. If you can’t make it to the reception, the pieces will hang through the end of March.